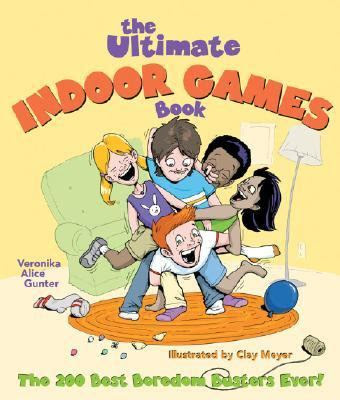 We had some fun this afternoon, with a game I found suggested in Veronika Alice Gunter's The Ultimate Indoor Game Book. With 200 in-the-house, boredom busting games, it's a great resource for warding off cabin fever. Our game of choice today, was cup racing. ...and tied the ends to a couple of chairs, placed back to back, across the room from each other. The children blew in the cups, to make them move. The first one to reach the opposite chair, with their cup, was the winner. We did something similar to this one summer (outside, tho. )except that we taped a straw to the top to string the thread through and we just raised the string up and the cup flew. Yours certainly does look like fun for inside play! I so have to check out that book because my kids are slipping back into destructo zone. Ugh, I've had two water disasters in less than 24 hours. That book sounds great! I love the pictures of the game in action! Looks like fun! It's so great that you have a large family to do these things with. Looks like fun! Looks like a super book. I love the activity you chose to do, fun! Joyful Learner - Yes, but this was fun, one on one with the kids, too. I left it up all afternoon (until the Man of the House came home), and challenged whichever kid came through the room, to a race. Oh how fun! Your daughter was sure serious about getting her cup down to the finish line! That is a priceless picture. This looks like so much fun! Maybe we should set it up for the next playdate! I recognized the activity from that book as soon as I saw the description on pinteresst! That book is AMAZING -- in years of doing school-age care it was my favorite activity book ever. (others are more exhaustive, but it was the most useful. Sock wrestling, also in that book, was a life-saver when the older boys (ten and eleven) started to get cabin fever, and it was rough-and-tumble play my center director could allow. Thank you so much for the post you do. I your post and all you share with us is up to date and quite informative, i would like to bookmark the page so i can come here again to read you, as you have done a wonderful job.